Is the office of apostle and prophet in the midst of being re-established, as some people would have us believe? And is the God-ordained government of the Church now in place for the first time since the early days of the initial believers of the first 300 years? Churchwatch Central (CWC) continues to expose a diabolical movement that has infiltrated the visible Church known as the New Apostolic Reformation (NAR). 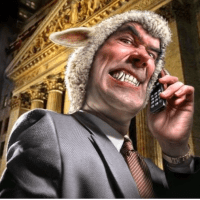 In this piece, CWC reveals that from the very beginning of the movement the wolves in sheep’s clothing mentioned above were fully aware of and on board with the plan to lay the foundation for a global church governed by them. What makes this article fascinating is the mindset of the NARpostles back in 1999. They are extremely superstitious, into omen readings, fearful of events (like the Y2K bug and terrorism) and completely obsessed with their apostolic strategies, prophecies and future direction of the church. Their language and concepts all reinforce the false gospel, eschatology, pneumatology and basileology of the New Apostolic Reformation. Titles such as ‘Third Day Church’ and concepts regarding the Jordan River all portray these leaders as Joshua’s (Apostles) leading the ‘church’ into the ‘promised land’, to further their idea of what the kingdom of God is in society. So why was this event so important to all those gathered? Notice that the pastor can be the apostle in their double-speak and how they connect the prophet to the Old Testament ‘watchman’ and the pastor/apostle to a ‘king’. This cannot be missed when dealing with these cult-leaders. They will often convey their positions of authority in the church as though they are in divinely appointed king-like authorities. They twist phrases like “touch not God’s anointed” – King Saul was not to be touched because he was anointed by God, thus none should question the apostle/pastor such as Benny Hinn, Creflo Dollar, Kenneth Copeland and others. Furthermore, just as we see with Dr. Michael Brown’s eschatology, these apostles believe in the doomsday cult prophecies of the New Order of the Latter Rain end-times revival/awakening. The above quote highlights their belief in a 50/50 polarization of good and evil. The church will awaken when their Apostles and Prophets take their place and the New Breed manifest as ‘gods’ to judge the wicked.